Despite the inclement weather on the day a huge amount of the girls joined with Nenagh Eire Og Juvenile club to march in the parade. It was one of the biggest groups in the parade showing huge respect to the parade organisers. 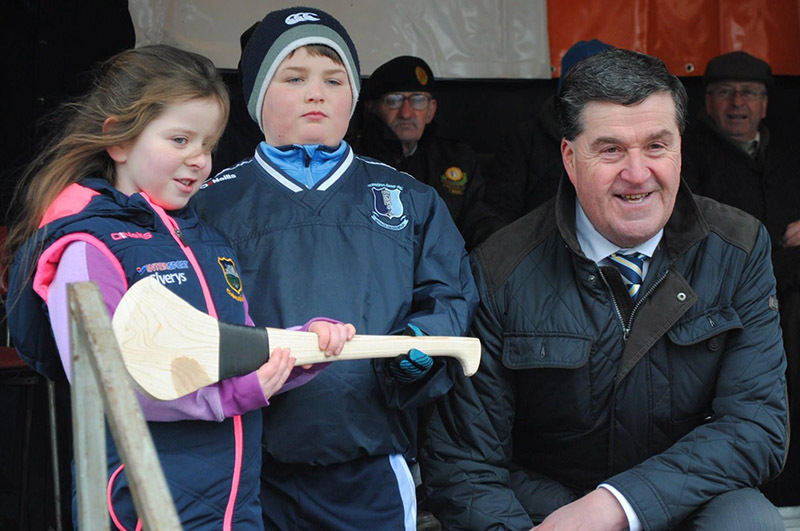 A Hurley was presented at the viewing stand to the Nenagh municipal Caoithearleach Cllr. John Carroll by Meabh Quinn and Oisin Archard. Many thanks to both clubs for the treats which were really appreciated by the participating children. U 6/u8 . Great numbers at training last week. Any girl interested in joining can be added to the WhatsApp group by any parent involved. New players always welcome. We will be selling helmets at training to help the girls ready for outside training as soon as the weather takes up. U12 . The league starts next Monday April 02 at 11.30at home to Newport. Can you contact James O Dwyer with your availability. U 16 . We had a really exciting game against Portroe on Saturday just pulling away at end winning by 7 points. The winter training is beginning to pay off. Our next game is away to Burgess. Training continues as usual this week. Tipp intermediates. Well done to Sarah Quigley, Ruth Hasset and Hazel MacAuliffe and their Tipperary Intermediate colleagues who defeated Laois on Sunday ensuring a place in the Semi Final.